Swedish, 1885-1948, was a Swedish modernist painter. Hjerten is considered a crucial figure in Swedish modernism. Periodically she was highly productive and she participated in a large number of exhibitions. She worked as an artist for 30 years before succumbing to complications from treatment for a psychiatric disorder. Sigrid Hjerten was born in Sundsvall in 1885. She studied at the College of Crafts and Design in Stockholm and graduated as a drawing teacher. At a studio party in 1909, Herten met her future husband, twenty-year old Isaac Grenewald, who had already studied one year with Henri Matisse in Paris. Grenewald convinced her that she would do herself more justice as a painter. Later that year she went to Matisse's art school as well. 1910s As she studied under Henri Matisse in Paris, she was impressed by the way he and Paul Cezanne dealt with colour. This shows in her painting in contrasting colour fields and simplified contours, her way of achieving the greatest possible expressiveness. Her aesthetic intentions had primarily to do with colour, and in her later works from the 1930s she spoke of colours in terms such as cold yellow. Hjerten strove to find forms and colours that could convey her emotions. In that respect her work is more closely related to the German Expressionists, such as Ernst Ludwig Kirchner, than to the French painters, with their graceful play of lines. After a year and a half she returned to Sweden. In 1912 Sigrid Hjerten participated in a group show in Stockholm. In the following ten years she took part in several exhibitions both in Sweden and abroad, among other places in Berlin in 1915, where she was well received. Sigrid Hjerten was also represented at the Expressionist Exhibition at the Liljevalch's konsthall in Stockholm in 1918, together with two other artists. However, most of the critics then were writing scathing reviews about her art. In Hjerten's art, where she greatly exposes herself, one notices different stages of development. The influence of Matisse is perhaps mostly discernible in the 1910s. 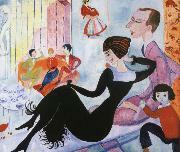 During this decade, Hjerten created many paintings with indoor pictures and views from her home, first at Kornhamnstorg Square and later at Katarinavägen Street, in Stockholm. Her husband Isaac Grenewald and her son Iven, as well as Sigrid herself, are often depicted in scenes that embrace various sorts of conflicts. At this time Sigrid Hjerten got acquainted with and inspired by the art made by Ernst Josephson during his illness. Ateljeinteriör (Studio interior) from 1916 shows how radical Hjerten was for her time. The painting describes the roles she played as artist, woman, and mother: different identities in different worlds. Hjerten sits on the sofa between two artists - her husband, Isaac Grenewald, and Einar Jolin - who talk to each other over her head. Her large blue eyes stare into the distance. In the foreground a woman dressed in black-a sophisticated alter ego-leans against the artist Nils von Dardel. Her son Iven crawls out of the right-hand corner. In the background we glimpse one of Hjerten's paintings of the period, Zigenarkvinna (Gypsy woman). Studio Interior and Den röda rullgardinen (The red blind) from 1916, are daring paintings that have given rise in recent years to new interpretations based on contemporary gender studies and revealing information about the artist's life. For long periods Sigrid Hjerten lived alone with her son and a sister of her husband. Sigrid and Isaac seem to have been very attached to one another, but their marriage met with great problems. Sigrid apparently had difficulties with her identity as a woman and in combining her different roles as a mother, a wife and an artist. The conflicts of her life made a mark in her painting. 1920s Between 1920 and 1932, Sigrid Hjerten lived in Paris, and made many excursions to the French countryside and the Italian Riviera for painting. This was a relatively harmonious era in Hjerten's art, but her exhibits were very limited in this period. Her husband, Isaac, mostly lived in Stockholm where he had a brilliant career. In the late twenties Hjerten increasingly suffered from various psychosomatic ailments, and she complained of loneliness. As time passed, an increasing tension can be seen in her art that successively rises and reaches its height immediately before the disease forces Sigrid Hjerten to cease as an artist. In the late twenties, while she was very isolated in France, colder and darker colours began to show. Recurring diagonal strokes helped to give the paintings a tense impression. During the thirties Hjerten painted innovative paintings which are characterized by menacing tones, growing storm clouds, and feelings of abandonment. 1930s In 1932, Sigrid Hjerten decided to return to Stockholm. But during packing she collapsed. She got to Sweden and was temporarily taken to the psychiatric hospital of Beckomberga with symptoms of schizophrenia. She recovered periodically and in the two following years (1932 C1934) Hjerten's artistry culminated in a crescendo, where, like one possessed, she made pictures that expressed strongly loaded feelings. One gets the impression that she tried to master a threatening inner chaos with her creative work. She devoted herself to intensive painting, creating one picture a day, the picture-book of her life, according to an interview in the Swedish art magazine Paletten. Some paintings radiate horror while others give a warm and harmonious impression. During 1934, she traveled with her family in the south of Europe, where she painted. Sigrid Hjerten eventually made her name as an artist among the critics in 1935, when she exhibited with Isaac and Ivan in Gothenburg. Yet, most contemporary critics had a negative and even scornful attitude towards Sigrid Hjerten's works of art, and many of them wrote deeply offensive reviews. Among other things her paintings were called idiocy, humbug, horrors and products of handicap. She won public recognition only in 1936, when she had a well received solo exhibition at the Royal Swedish Academy of Arts in Stockholm. Isaac, who had many mistresses over the years, divorced Sigrid and remarried. (Both Isaac and his new wife later died in a flying accident in 1946). At that time, Sigrid suffered from escalating mental illness, diagnosed with schizophrenia, and was permanently hospitalised at Beckomberga Psychiatric Hospital in Stockholm, where she remained for the rest of her life. After 1938 her artistic output dwindled. Following a botched lobotomy, she died in Stockholm in 1948.